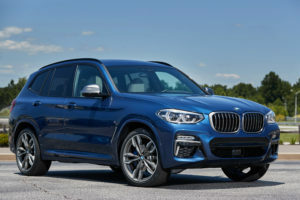 BMW’s next-generation X3, which goes on sale this month, dropped more than 121 pounds than its predecessor and features a body-in-white and exterior mixing steel and aluminum. The global version of its launch news release described the weight cut and “intelligent lightweight construction.” The OEM also noted that more than 50 percent of its aluminum had been recycled. For those exterior hits, know that the hood, fenders and front doors are all aluminum. The back doors are bake-hardened steel, probably for dent resistance, and the roof and quarter panel are deep-drawing steel. Besides these exterior considerations, shops should look for the BMW Active Kidney Grille and BMW Air Curtains on the front of the vehicle; both can automatically adjust themselves to improve aerodynamics. The new X3 will also be the first BMW “Sport Activity Vehicle” in America to have a factory-installed hitch. 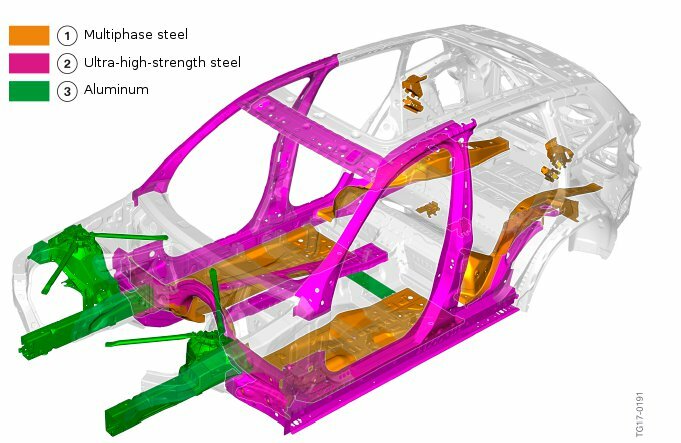 As for the body-in-white, the front roof crossmember, frame rails, and A- and B-pillars are all ultra-high-strength steel, which severely limits procedures like sectioning or repairing. The shotguns, strut towers and a floor crossmember are among the aluminum components, while other elements are multiphase steel — which while not as strong typically as ultra-high-strength steel might also have repair restrictions. The car detects accident severity and can locate itself — and according to BMW, the X3 now can detect low-speed crashes even if the airbag didn’t blow. This is interesting because such low-speed collision detection and contact could cut into the amount of business uncertified shops see, assuming these service partners BMW will set you up with include certified BMW body shops. 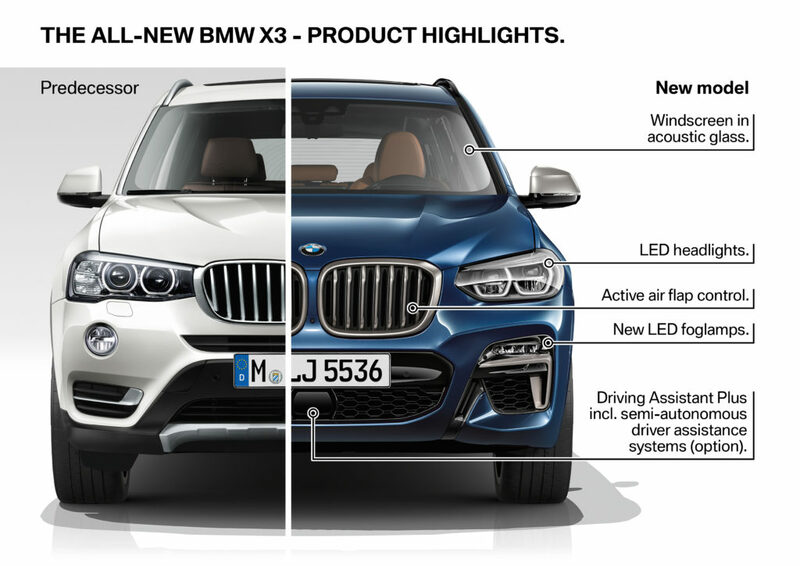 Other safety features include a standard system in which X3 preparing itself automatically for a collision, automatically closing the windows and moonroof and activating seat belt tensioners. If the car thinks you might rear-end someone, it “prepares the vehicle systems for a possible impact from vehicles behind” as part of its frontal collision warning. After a crash, the car can automatically stop itself. When it comes to driver assistance and semi-automated driving, all the systems currently offered by BMW are available, such as the latest generation of Active Cruise Control (ACC) with Stop & Go, whose capabilities include braking the car to a halt in stop-and-go traffic and automatically restarting to drive. The Driving Assistance Package includes Active Blind Spot Protection, Lane Departure Warning, Daytime Pedestrian Protection, Frontal Collision Warning with City Collison Mitigation, Cross Traffic Alert rear, and Speed Limit Info (Navigation system required). The Driving Assistant Plus Package offers additional comfort features: Active Cruise Control with Stop & Go, Active Lane Keeping Assistant with Side Collision Avoidance, Traffic Jam Assistant, Evasion Aid & Cross Traffic alert front and rear. BMW sold more than 44,000 of the last-generation X3 in 2016, up 38.4 percent. So odds are good that certified shops will encounter the new edition.